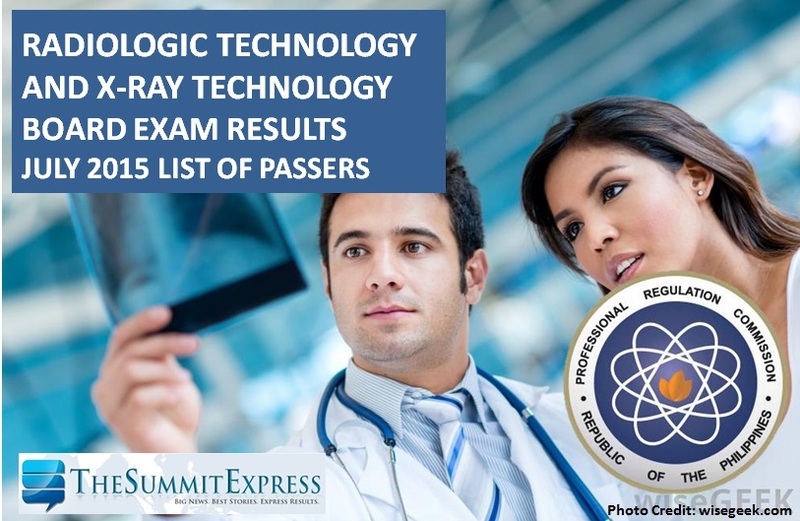 Those awaiting results of July 2015 Radiologic Technologist (Rad Tech) and X-Ray Technologist (X-Ray Tech) board exam can find here the complete list of passers, top 10 (topnotchers), top performing schools and performance of schools as the Professional Regulation Commission (PRC) and the Board of Radiologic Technology released results in 3 working days after the exam. PRC on Thursday night, July 9 announced that 1,325 out of 3,043 passed the Radiologic Technologist Licensure Examination and 53 out of 210 passed the X-Ray Technologist Licensure Examination. The examination was conducted in the cities of Manila, Davao, Iloilo, Lucena and Tuguegarao on Sunday and Monday, July 5 and 6, 2015. Radiologic Technologists (Rad Tech) board exam covers the following subjects: radiologic physics, equipment and maintenance, radiobiology, radiation protection and quality assurance, image production and evaluation, radiographic procedures and techniques, and patient care, management, ethics and jurisprudence, human anatomy and physiology and medical terminology and radiological sciences. Meanwhile, X-Ray Technologist 2-day exam covers the same subjects above excluding radiological sciences. In July 2014 exam, full results were out in just 2 working days. PRC named a total of 1,258 out of 2,150 passed the Radiologic Technologist Licensure Examination and 43 out of 158 passed the X-Ray Technologist Licensure Examination. Davao Doctors' College topped the Radtech board with 96.39 passing rate. Like Us on Facebook or Follow Us on Twitter to receive updates on licensure exams. You may also subscribe to our E-Mail List.